In search of a recipe for the large bunch of watercress, I remembered this stew recipe from one of my favorite cookbooks [read my book review on Goodreads.com]. The Chinese Herbal Cookbook combines Chinese herb ingredients with European cookery. When used as an accompaniment to this stew, the watercress takes on an amazingly mild character. The stew itself is dark and smoky, and slightly sweet, and as such is actually a more appropriate dish for fall or winter than spring. 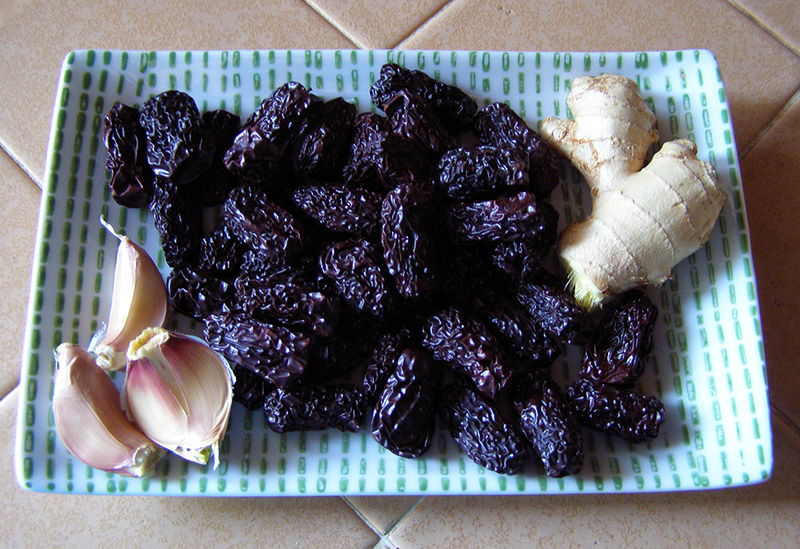 Dried Chinese dates, both black and red, are needed for this recipe. Find them in herb stores or Asian markets. Black dates taste smoky, red are sweet and add a warm color. Because I could only find black dates, I substituted them for the red and added 1 tbsp. honey. 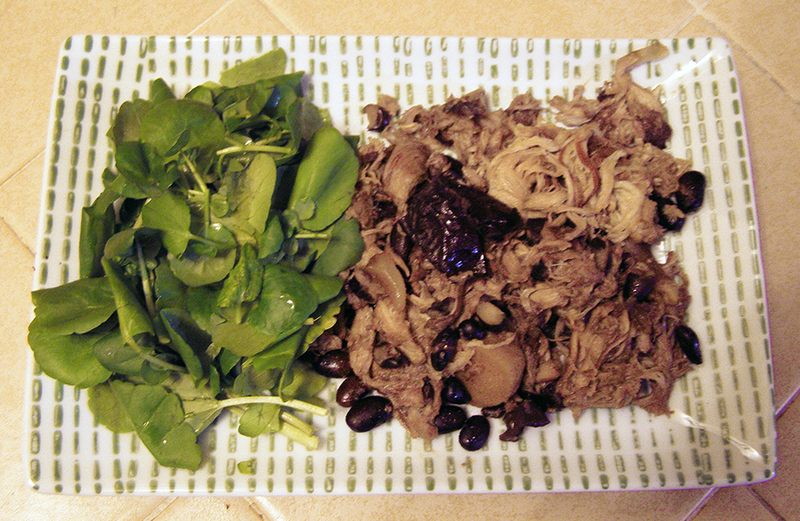 The dish was extra-smoky (and delicious), but a bit lacking in color. I usually add up to twice the number of dates called for, and substitute full chicken legs, with skin and fat removed, for the drumsticks. I would not substitute boneless cuts. Bones provide lots of flavor when cooked for hours. This recipe can easily be doubled. Someday I’ll try making it in the slow cooker—or maybe you’d like to try that and post a comment on your timing details! When eating, be cautious of small bones and date pits. Probably not a meal for families with small children—or to prepare for a first date. I never make the gravy, as it doesn’t seem necessary. I also skip the first step, frying the beans, because my husband says the beans don’t cook up soft enough that way. 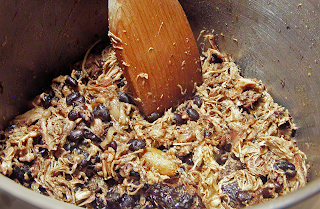 Put beans, chicken, red and black dates, ginger, and garlic in large saucepan, electric frying pan, or soup pot. Cover with water, broth, or combination. Season with salt and pepper if desired. Bring to boil, cover pan and simmer gently for 3 hours. You might want to check water level and stir to be sure beans are covered every hour or so. By this time, the chicken will have fallen off the bones, so remove the bones and cartilage. At this point, I serve it from the pan with chopped watercress. 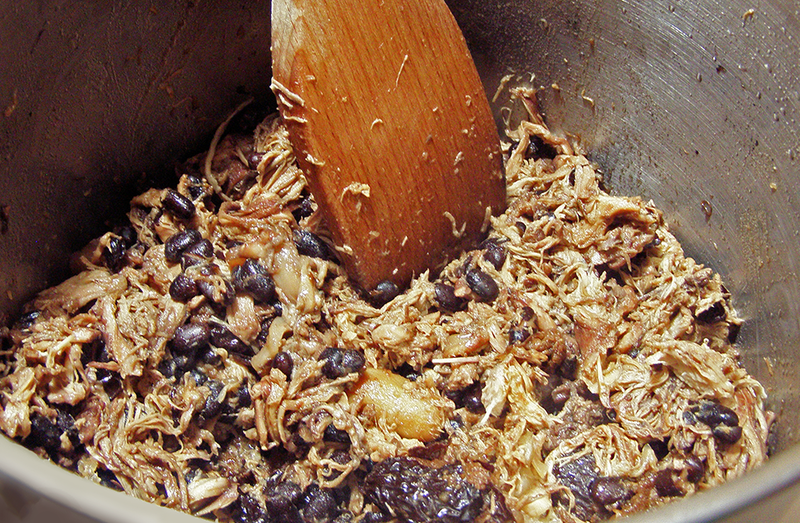 However, the official recipe continues: transfer the meat, dates, and beans to warm serving plate using slotted spoon. Keep warm. If necessary, boil the remaining liquid in the pan to reduce and thicken, or dissolve arrowroot in a little water and add to juices in the pan and simmer 5 minutes, stirring. Pour sauce over stew, garnish with watercress, and serve with rice.